The Pearl Summary tells the story of a pearl diver named Kino. As one of the most profound pieces of American literature, John Steinbeck’s novella The Pearl tells the story of a pearl diver named Kino. His son, Coyotito, is suffering from a scorpion’s sting; Kino is poor and cannot afford to pay for the medical services. However, while diving one day, Kino finds a very large pearl which he hopes to sell to pay for the necessary treatment. This, however, marks the beginning of nothing but trouble for Kino and his family. 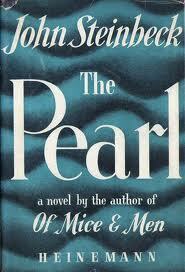 The townspeople hear about the pearl; they all begin to demonstrate greed and selfishness and try to take it from Kino, using outright violence as necessary. When Kino tries to sell the object, he does not receive what he believes is a fair offer, so he rejects it; he intends to take the pearl to the capital where he feels he can receive a better offer. Meanwhile, his domestic partner, Juana, takes the pearl one night with the intention of throwing it back into the ocean to rid the family of all the hardships that have followed it. Kino discovers the plan, and throws her to the ground and leaves her on the beach. After further episodes of violence, Kino and Juana flee the town to go to the capital; getting rid of the pearl is the only way they are to bring peace and safety to their family. On their journey, they are followed by a band of trackers; Kino realizes that he needs to get rid of them if the family is to be successful. While he is waiting near their camp one night, about to strike, Coyotito’s cry is heard through the wilderness. When Kino attacks one of the trackers, the gun fires, and hits the baby, killing it. The morose couple returns to their town and throws the pearl back into the ocean; they want nothing to do with it for it has only brought them ruin. In “The Pearl”, Steinbeck expresses the fact that man’s manifestation for wealth and property leads to the self destruction of man, both mentally, and physically. The Priest of La Paz, The doctor, and Juana were all affected by the affects of greed. Whether they are striving for wealth or are in the path of those that are, they are all equally affected. The story of Midas lives on as a caution to those who crave the warmth and comfort of money. Beckoning to those who struggle to achieve wealth, and hoping that they will respond, and possibly not put wealth on the top shelf of life. Paper Masters writes custom research papers on The Pearl Summary and discusses the story of a pearl diver named Kino.